"Baby Deer Address Labels" product is already in your cart. 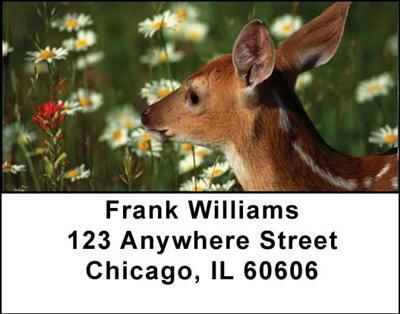 Delightful and endearing makes these Baby Deer Address Labels especially fun for lovers of nature and the outdoors. The delicate features of these gorgeous animals are displayed beautifully in four scenes that show: a pair of fawns eating grass around a group of trees, a single deer gazing into a field of daisies, a little fawn with a butterfly posed over its nose and another deer looking at the daisies and other flowers in a field. The precious pictures showcase how wonderful and innocent looking these Baby Deer Address Labels are and how delighted everyone will be to see them.